Plagued by the senseless death of a teen on his watch, patrolman Ryne Calvert feels he's failed in the line of duty--and as a man. His new job as the rescource officer at Angel Falls High will give him a chance to redeem himself--and to be closer to the elusive and lovely Kaci. Though he longs for more than friendship, Kaci thwarts his advances. She's hiding her heart from him, but why? 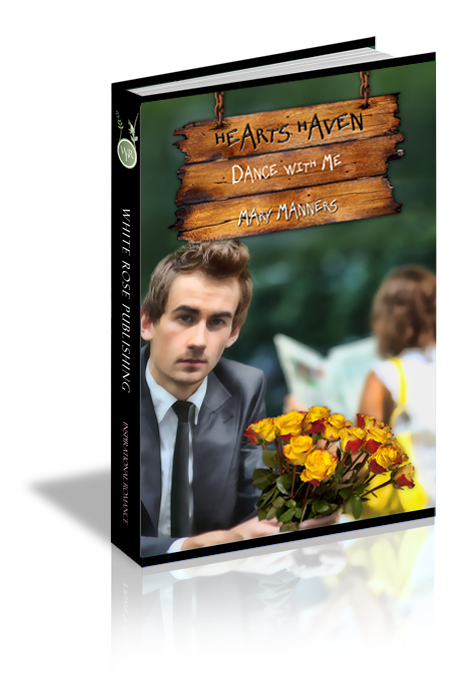 When Ryne, on a dare, seeks advice from Love's Lessons, he and Kaci begin the dance of romance. But when Kaci's secret is revealed, will the music end--forever? Kaci James blew a wisp of strawberry-blonde hair from her eyes and reached for her coffee mug, sipping as she puzzled over one of the letters she’d received for the “Love’s Lessons” column at the Angel Falls Trumpet. She frowned as the bitter brew nipped her throat then sighed and tossed the letter onto the table. What was she doing giving love-life advice to strangers when her own engagement had ended in such shambles less than a year ago? The very idea painted an irony of the worst sort. A sharp rap at the front door startled her, and a bit of coffee splashed over the mug’s rim to dampen her cream-colored peasant blouse. She frowned and glanced at her watch as she swiped at the coffee stain. Ugh…she’d worked right through dinner again! Another round of knocking. Quickly, Kaci gathered the letter and stuffed it into her tote bag. The note could only lead to trouble if others found out she moonlighted as the advice columnist. What would her neighbors here at Heart’s Haven—and the students she taught English to at Angel Falls High, for that matter—think of her if they knew what she did on the side? “Love’s Lessons” was one of the most popular advice columns in the greater East Texas area, and she’d like to keep it that way. That meant keeping her role anonymous. She nudged her reading glasses up the bridge of her nose and vaulted over Patches—her feisty calico cat—careful not to step on his tail as she rushed to the door. She peeked through the spy-hole and her heart lurched. Ryne Calvert waited on the porch, his close-cropped dark hair crowning captivating blue eyes. A pair of wide shoulders and a set of washboard abs tucked into faded Levis set Kaci’s heart skittering. Since she’d moved in to Heart’s Haven last August, he’d been coming over to check on her with greater and greater frequency. And Kaci had to admit, with his generous muscles and lopsided, mischievous grin he was easy on the eyes. Now, he held a casserole dish in one hand, neatly covered with foil. Kaci’s belly let loose the most unladylike growl, reminding her she’d skipped dinner, and she was thankful the door remained closed so Ryne wouldn’t hear. “Kaci?” His voice, deep and smooth as a bass guitar, drifted through the door. “You don’t?” Kaci was tongue-tied by his admission. He hoped to have a girlfriend soon? Did he have someone in mind? Her heart sank just a bit. She was in no way ready to plunge into the dating world again, yet the thought of Ryne sharing a meal—and possibly more—with another woman gave her belly an odd little tug. She reminded herself Ryne was her friend…nothing more. How could he respect a woman who was so unlovable, who’d failed at romance so miserably that her fiancé left her stranded at the altar? She took her time uncovering the creamy concoction, still bubbling from the heat of the oven, as Ryne propped a hip against the counter. One look—at Ryne, and then the casserole—and Kaci’s mouth watered. Again her belly grumbled, this time well within Ryne’s earshot. He burst into laughter.